Pears are noted both for their beautiful spring blooms and their sweet fruits. Many pears are considered ornamental landscape features for their impressive spring flower show. 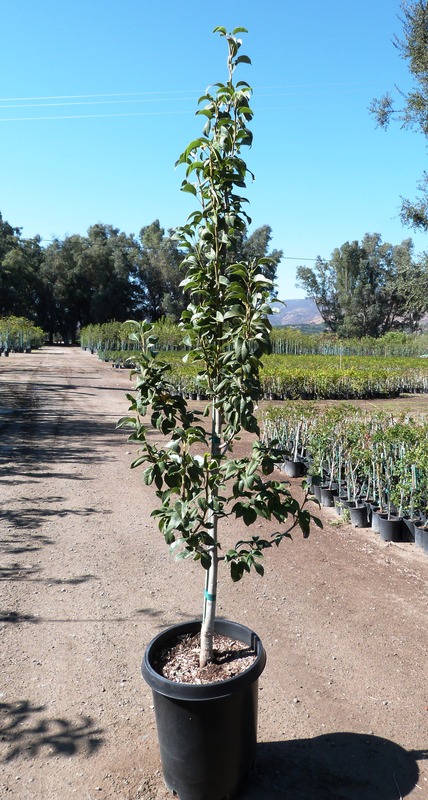 All pear trees require full sun exposure in order to thrive, but can tolerate a variety of soil types as long as they are well-draining. While many pears are self-pollinating, some need another pear variety close by with which to exchange pollen. For those that need a cross-pollinator pear to bear fruit, plant the different varieties within 50-feet of each other. For varieties that do not require a cross-pollinator, you still may fruit fruit production is improved with another variety nearby. As with many fruits, pear varieties have different chilling time requirements. These are the number of hours they are exposed to temperatures between 32-50F during the winter months. ‘Twentieth Century’ Asian pear requires only 300-400 hours chill time, which makes it appropriate for warmer climates. Plant it with ‘Shinseki’ Asian pear or the quintessential ‘Bartlett’ or ‘D’anjou’ for even better fruit production. Each of these pear tree varieties will grow to 12- to 15-feet tall. Fast growing ‘Kieffer’ pear tree grows quickly to 20- to 25-feet and performs well in zones 4-9. ‘Keifer’ is also also tolerant to fire blight disease.‘Bosc’ is a classic pear tree that grows to 12-feet and does require a cross-pollinator. Plant with ‘Bartlett’ for good fruit production. Many of our pear tree varieties also come in semi-dwarf sizes for smaller landscapes or large containers. Pear trees are susceptible to pests such as fire blight disease, aphids, mites and powdery mildew.